I’ve been sharing the wonders of edible flowers for ages now. First when teaching at TAFE, then at Ecobotanica classes and now with my book, ‘A Delicious Bunch, growing and cooking with edible flowers’. As I write this, its November and the daylilies have sprung into flower in the vegetable garden. They take up a joyous site around the bathtub pond where the dragonflies zip in and out by day, and the birds nip in for a drink from dawn to dusk. Daylilies my go-to snack food when I’m working in the garden. The petals are crisp, and lightly sweet. I don’t mind eating them fresh from the stem (scape) like this, as I know that each flower only lasts one day, and will be gone tomorrow if I don’t make the most of them when I can. 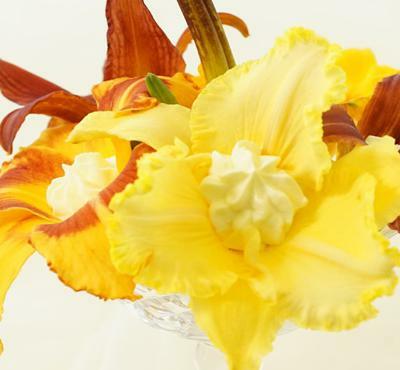 I was told as a young horticulturist, that the only edible daylilies were the yellow ones. 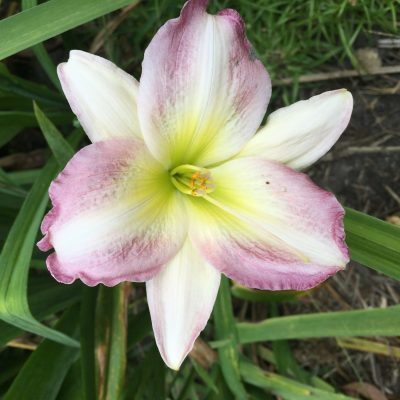 However, through extensive research I’ve found that all daylilies are edible, from the pinks and purples to the white and gold. Many cultivars now exist, but both the Hemerocallis fulva and the Hemerocallis lilioasphodelus are edible. The only stipulation is that they are grown organically and are chemical and contaminant free. 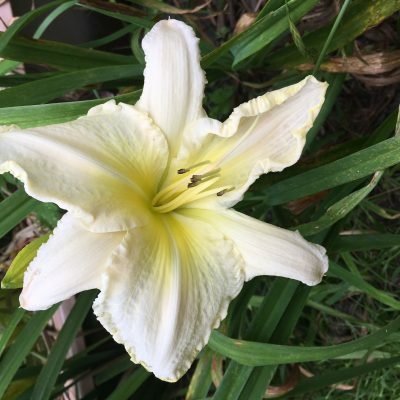 Daylilies are such generous plants. They flower over a long period in pretty challenging conditions, and are often found in public spaces, growing without irrigation. I always feel the need to lift and divide them each second year, even if they are in the local library garden! I probably wouldn’t get away with it at the library, but I do it at home. This the means of division and ensures you have healthy plants. I add a good dose of rock minerals to our hungry and depleted soil, and some compost and manure fertiliser to the soil when replanting. When I pick a flower or the buds for eating, I feel quite connected to gardeners and foragers of ancient times. Historical use has been identified from Neolithic times! Hemerocallis fulva are native to south east Asia. Research papers have identified the use of daylily flowers for their laxative, antidepressant, sedative and antispasmodic properties. The roots have many uses including an antidote to arsenic poisoning. There are a number of ‘types’ and many cultivars under this genus and species. Hemerocallis lilioasphodelus originate from Russia, Mongolia, China and parts of Europe. 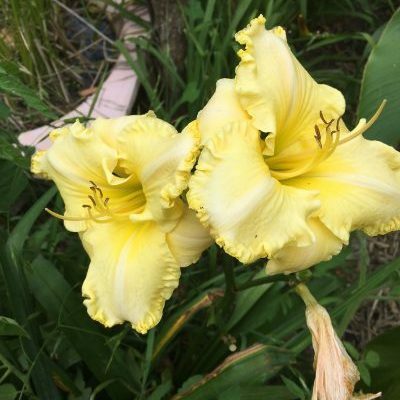 These are typically the yellow daylilies also known as Golden Needles which are eaten fresh as buds or flowers. They can be dried after boiling for use as a spice. Flowers are typically battered and fried, added to noodle dishes and stuffed. Traditionally as folk medicine, the dried flowers were recommended for treating nosebleed, arthritis and to improve appetite. Harvest the flowers and full, firm buds in the morning while still crisp. Buds can be refrigerated for a couple of days. Use the flowers the day you pick them. Before consumption, remove the central pistil and the stamens that bear the bitter pollen. In the book I have included a recipe for stuffed sweet daylily flowers and directions for stir fried buds with soy sauce and a sweet caramelised dessert. 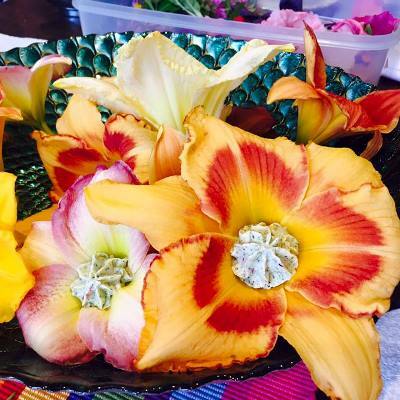 No matter which way you enjoy them, don’t let your daylilies go to waste!